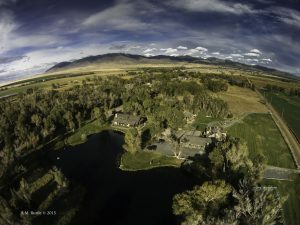 Healing Waters Lodge is a fly fishing lodge, located in southwest Montana in the heart of the Ruby valley between the towns of Twin Bridges and Sheridan and approximately 28 miles north of Dillon. We are literally surrounded by mountain ranges, conservation minded landowners, and prolific trout habitat that includes spring creeks, streams, and rivers such as the Beaverhead, Big Hole, Jefferson, Madison, and Ruby. The original Healing Waters building (main lodge) was built in 1891 in Sheridan, Montana. It was intended to be the first hospital in Sheridan which meant that it had a surgery, living quarters for the doctor and a couple of rooms for patients. Through the years the building went through a number of different iterations and its last life in Sheridan was as a family residence with a brick façade. In the mid 1980’s, Jim and Sara Cox bought the old brick house, stripped the bricks from the wooden frame and moved the original 1891 wooden frame onto its current location on 20 acres among the cottonwoods and bordered by Wisconsin Creek. For the next two years the Coxes lovingly restored the old hospital with stone quarried locally in the Twin Bridges area, hand hewn timbers from western Montana and hardwood floors from their original family farm in Pennsylvania. Because the original building was a hospital and it was moved to the banks of the small pond near Wisconsin Creek, the Coxes named their newly restored home, Healing Waters Estate. In the late 1980’s Jim and Sara Cox moved to South Carolina and put Healing Waters Estate up for sale. Fly fishing outfitter, Greg Lilly (son of famous fly fisherman and conservationist, Bud Lilly) recognized the excellent location of Healing Waters Estate with regard to easy access to the area’s blue ribbon trout streams and he and wife, Janet, purchased it from Jim and Sara Cox in 1996. The Lilly’s worked diligently to fulfill their vision of converting the estate buildings into a fly fishing lodge and on April 15, 1997, the first guest arrived at Healing Waters Lodge. Greg and Janet Lilly kept the name Healing Waters because fly fishing is considered by many practitioners to be “healing to the soul”. For six seasons the Lilly’s strived for excellence in providing a fly fishing, lodging and dining experience that would truly send their guests home with renewed energy and a fresh outlook on life. In 2002, the Lilly’s sold Healing Waters Lodge to the Sywassink family. The Sywassink’s operated the lodge for four years and then put the lodge up for sale and moved on to other business interests. Greg and Janet Lilly and partners Bill and Mary Kemph, leased and operated the business from the Sywassinks for the following six years. The combined talents of the Lilly’s and Kemph’s provided their guests with an excellent cadre of fly fishing guides, an endless variety of fly fishing location opportunities, access to fly fish on private ranches, walk-wading, floating, and floating local rivers that Bucket Lists are made of. At the end of the 2013 season the Lilly’s retired from the business and Mike and Laura Geary purchased Healing Waters Lodge from the Sywassinks. Based in Helena, Mike Geary has successfully owned and operated Lewis & Clark Expeditions Fly Fishing Outfitters for over 25 years and is the largest outfitter on the coveted Smith River, provided a guide service on the Missouri, Blackfoot, and Upper Clark Fork. The Geary’s moved their business from Helena to Twin Bridges and also operate Healing Waters Lodge. For two seasons, Bill Kemph, owner of Lilly & Kemph Outfitters, provided the guide service for Healing Waters Lodge and at the end of the 2015 season, sold his fly fishing outfitting business to Mike Geary. Excellence is always our goal. Whether you are a guest of Healing Waters Lodge or on our five day float trip down the Smith River, our goal is to provide you with the best possible fly fishing vacation experience. We believe we have excellent fly fishing guides and the best possible fly fishing locations available on the planet.